Recently, Ontology-Based DataBases (OBDB) have been developed as a solution to store and manipulate, efficiently and in a scalable way, ontologies together with data they describe. Currently, existing OBDBs propose weak solutions to calculate derived (non-canonical) concepts. Indeed, these solutions are internal to the OBDB and specific to the ontology model (formalism) supported. As a consequence, non-canonical concepts can not be in all cases properly defined with the different available mechanisms since existing solutions are not constantly suitable. In this paper, we propose a generic solution which is an extension of OBDBs with the capability to introduce dynamically operators to calculate non-canonical concepts. These operators can be implemented in different ways (e.g. with external programs or with web services). 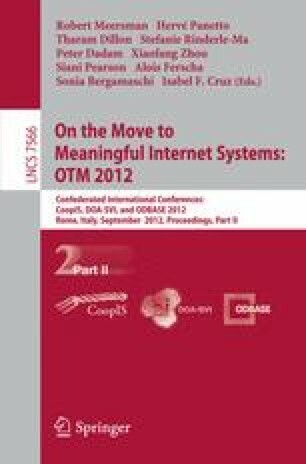 Then, we show the interest of this extension by improving a proposed methodology to design databases storing ontologies. Finally, a prototype implementing our design approach is outlined.